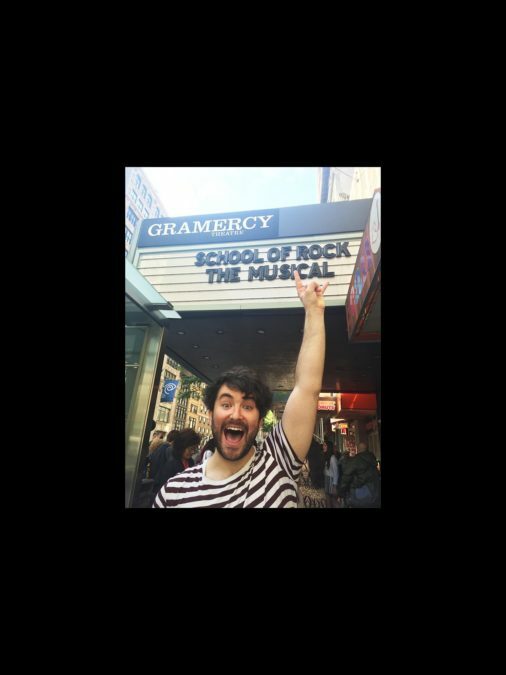 After successfully schooling the workshop of School of Rock—The Musical in rock appreciation, Alex Brightman (no relation!) will lead the production on Broadway. He is appearing in the role of Dewey in the tryout of the show, which is currently playing to invited audiences at New York's Gramercy Theatre. School of Rock will begin previews on November 9 and officially open on December 6 at the Great White Way's Winter Garden Theatre. Brightman's Broadway credits include Big Fish, Matilda, Wicked and Glory Days. This will be the first time that he has originated the lead role in a big Great White Way musical. Lloyd Webber has a long history of star-making—his more recent discoveries include Sierra Boggess and Ramin Karimloo (who both appeared in Phantom before leading his first production of Love Never Dies), along with Jessie J and Samantha Barks. No word yet on additional casting. Joining Brightman in the workshop are Leslie Kritzer as Patty (Ned's mean girlfriend), Sara Chase as Rosalie (the headmistress) and Andrew Durand as Ned (Dewey's bestie). The students include Taylor Caldwell as Shonelle, Evie Dolan as Katie, Aaron Fig as James, Carly Gendell as Marcy, Shayan Hooshmand as Mason, Bobbi Mackenzie as Tomika, Dante Melucci as Freddy, Brandon Niederauer as Zack, Luca Padovan as Billy, Jared Parker as Lawrence, Isabella Russo as Summer, Malachi Samedy as Leonard, Mikayla White as Madison and Corinne Wilson as Sophia. Rounding out the company are the adult ensemble: Natalie Charlie Ellis, Alan H. Green, Michael Hartney, John Hemphill, Merritt David Janes, Jaygee Macapugay, Abby Mueller, Tally Sessions, Mariand Torres and Jeremy Woodard. Directed by Les Miz's Laurence Connor, the tuner features music from the movie, as well as new music written by Lloyd Webber and lyricist Glenn Slater, with a book by Downton Abbey’s Julian Fellowes. The film was penned by Mike White, directed by Richard Linklater and starred Jack Black as wannabe rock star Dewey Finn, who poses as a substitute teacher at a prestigious prep school. When he discovers his students’ musical talents, he enlists his fifth-graders to form a rock group and conquer the Battle of the Bands. The production will feature choreography by JoAnn M. Hunter, scenic and costume design by Anna Louizos, lighting design by Natasha Katz, sound design by Mick Potter and music supervision by Ethan Popp.